Speakers in Code: Festival Preview | LouFest Founder Brian Cohen: "We continually assess all aspects of the festival to make sure it gets better each year." Festival Preview | LouFest Founder Brian Cohen: "We continually assess all aspects of the festival to make sure it gets better each year." In 2010, LouFest started with a song called "Lucky Break." The band who played it, St. Louis' The Bottle Rockets, wasn't even supposed to be on the bill. They had been a last-minute replacement -- catching their "lucky break" -- and it was fitting that one of St. Louis' most successful bands would play the first note. I remember riding my bike to Forest Park in the morning and being able to hear The Bottle Rockets' soundcheck "Radar Gun" as I drew closer to Central Field. I remember there being around 200 or so of us standing in the sun for their early-afternoon set. And I remember thinking that maybe someday this could all work out. It has, and with your support, LouFest will keep growing and improving. Let's re-live last year's highlights. This year's LouFest (Sept 6 & 7; purchase tickets here) features headliners OutKast and Arctic Monkeys, and the setting is the same: Forest Park in St. Louis. As we did last year, we checked in with LouFest founder Brian Cohen to chat about the festival's progress. [SIC] Tell us about last year's festival, and how it was different from the three previous LouFests. Did you get a clear sense of what worked and what didn't? What did you change for this year's festival? [Brian Cohen] The biggest change last year was the size of the event. It was larger in everything from the lineup, to the number of stages, to the size of the footprint. Based on fan feedback and what we experienced first-hand, most things went very well. But with something this size there are always things you can tweak to enhance the experience. For instance, this year we’re increasing the size of the nosh pit to keep the food lines down and we’re adding a second entrance on the north side of the field to make it easier to enter and exit. We continually assess all aspects of the festival to make sure it gets better each year. Previous LouFest lineups have been light on hip-hop, although you had The Roots scheduled to perform in 2011, and they unfortunately cancelled the day before their performance. This year, you have the biggest hip-hop festival act, OutKast, on the bill. How do you feel hip-hop suits LouFest? Over the years we’ve booked several hip-hop acts, including The Roots, Das Racist and Thee Satisfaction. It’s a style that works well in outdoor festivals and our fans enjoy it. Outkast is definitely the biggest hip-hop act we’ve booked and they fit perfectly into our model, which is to bring world-class artists to St. Louis. Their reunion is one of the hottest tours of the year and we’re excited to be part of it. You stayed true to your word and have recruited local bands/artists to play LouFest every year, including 2014. What do you look for in a local band to play LouFest? Do you think more local bands are worthy of playing the festival? There are many local bands that can easily hold their own in our lineup. More than we could ever book in a single year. With so many contenders, it’s a challenge to decide how to fill the spots we set aside for local artists. On the one hand, we look for bands that have paid their dues in local clubs and are ready to play a large stage. But we also look for up-and-comers who are ready to make a splash. The only real test is whether you can wow an audience from the stage. 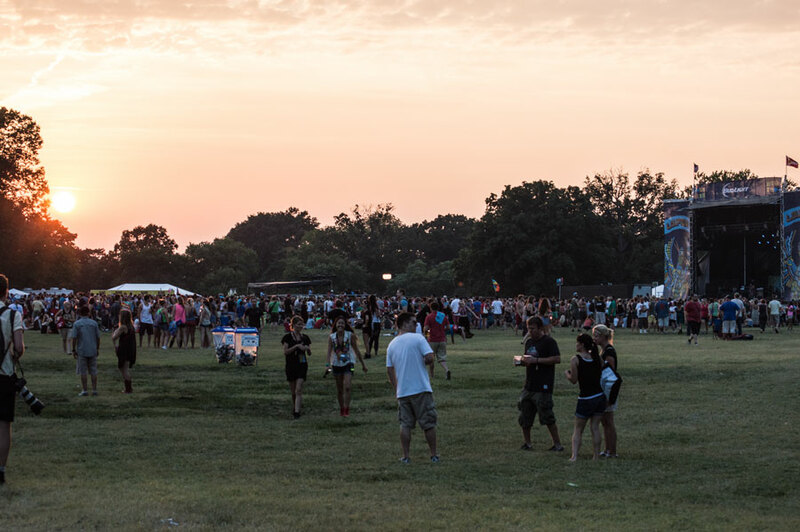 Besides enjoying the music, what's one of your favorite things to do at LouFest? Is there a moment every year that really makes the festival feel real to you? I love walking around and meeting new people. We have a very interesting and diverse fan base. Some are into food, some are into fashion, others are into art, and over the course of the weekend they all find something to tap into. For me, LouFest feels real the first time a crowd gathers in front of a stage. I scan the audience and see people of different ages, races, and lifestyles all sharing the same experience. That’s very rewarding. Finally, if LouFest continues to grow, will you consider using more of Forest Park or adding a third day? What needs to happen in year five to take more steps to eventually become a "destination festival?" In many ways, I think we’re already there. Last year, over one third of our fans came from outside of Missouri. In terms of growing to three days or adding more stages, we’ll let the fans decide that. If it’s what they want, and they show us by buying tickets, then we’ll continue to grow. WIN TICKETS TO LOUFEST! Contest runs through Wednesday, August 20th at 5PM (CST).